I just got back from a lovely week in sunny Malta. 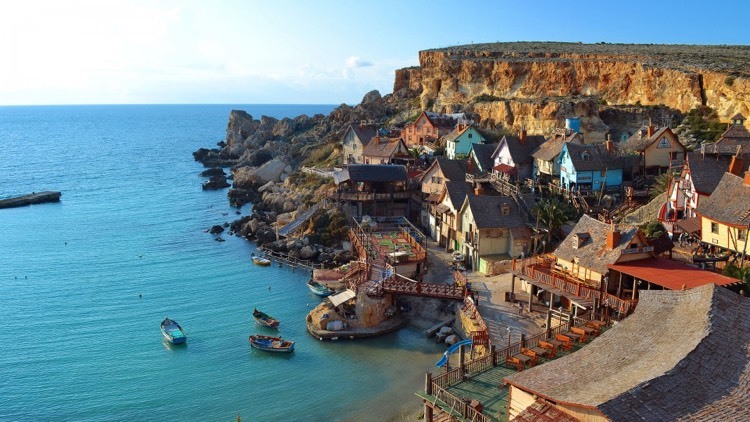 Malta has some truly brilliant hotels and 5 star resorts, which can be a wonderful escape for British sun seekers. The problem is, you really need to get out and about to discover what the island really has to offer. If you’re ever thinking of going, I strongly recommend that you steer clear of the tempting all-inclusive packages, rent a car, and see what the island really has to offer. Obviously, I’m going to talk about the food side of things, but if you’re into history, art, crafts or architecture, it will not disappoint. For those of you that have never been, Malta is a lovely island in the Mediterranean about 50 miles south of Sicily. It has had a tough past. Due to its highly valuable strategic location, Malta has been besieged by numerous occupying forces and during World War 2, was the most bombed place on earth. It has a fascinating history, with some of the oldest free standing structures in the world and multiple international influence owing not only to its Greek and Roman roots, but successive rule by the Normans, Spanish, French and British empires. Combine that with the influence from the Knights of St John, who introduced more Spanish, French and Italian influences, and you get a rich and varied cuisine. The island is relatively arid and hot and you get some fantastic local produce. Figs, peaches, prickly pear, tomatoes, courgettes and aubergines are all abundant. They have some of the best potatoes I’ve ever had. They are masters with pig and rabbit, the latter featuring in their national dish… rabbit stew. Local beef is of great quality and less than half the price of imports at just 12 euros for rib eye! Local delicacies include a number of unique jams (prickly pear, fig, pomegranate), local cheeses and wines. Where they really shine, however, is with their seafood. The fishing industry, which still observes artisanal methods, brings in a broad variety of some of the best fish you will find. Tuna, swordfish, octopus, mahi mahi, sea bream, sea bass, sea urchin, squid, lobster and crab are just some of the wonderful catches you’ll find in the local markets as you walk amongst the colourfully painted fishing boats. My parents moved to Malta 17 years ago, at about the same time I moved to the UK. I’ve been lucky enough to experience the island as the locals do. Walking down to the local bakery for a loaf of Maltese bread is a must. It is a beautiful, rustic sourdough bread, baked in wood ovens that makes the best bruschetta. You also should pick up a pastizzi, puff pastry filled with either chickpeas or ricotta which is a perfect snack and only about 30 pence. If you like carbs, they will not disappoint. Pasta, breads and pastries are in abundance, with the king of carbs… Timpana. This is essentially a pasta bake in a pie crust. Farmers markets and fish markets are spread across villages all up and down the island where you can find great deals on fresh produce as well as home-made delicacies and some of the best priced capers going. St Julian’s Bay has some great restaurants, and I’d personally recommend Girasole and Rafael’s, two restaurants located on different floors of the same building, that share great views of the bay and have consistently created some of my favourite memories from my visits. Piccolo Padre, located close to Sliema, is another of my favourites, with great pizza and a wrap around balcony hanging with views out to sea and back towards St Julian’s. Valetta, the capital, is where the newest, trendiest restaurants are and I don’t go often enough to recommend what’s best now, but I’ve always been happy just wandering up and down the small side streets, finding romantic little places where you can dine al fresco and enjoy the music of the many touring violinists and other artists. The neighbouring island of Gozo is well worth a day trip. Gozo is smaller, quieter, and you’ll find more artisanal products as they’ve held on to their historic roots a bit more. Make sure you try their local Gozitan cheese, gbejna, which is a barely-set, creamy, mellow, mild sheep’s cheese. You’ll find plenty of nice restaurants, but the best one, in my humble opinion probably doesn’t even have a name. It’s located in a small bay called Mgarr ix-Xini. Not an easy place to find, but if you can get decent directions from a local and navigate your way through the farms down the narrow, steep country road, it’s worth making a pilgrimage to. It’s essentially a sea container plonked down on the beach with hatches cut into it to make windows and doors. They have two barbecue grills, simple tables and chairs dotted along the beach in the shade of a few trees and a chalkboard leaning against a tree with the catch of the day. Prices still aren’t that cheap, considering they are probably not exactly paying taxes or utilities, but they are worth every penny. Sandra runs the place with husband Noel on the grill. The man knows what he’s doing, cooking on a medium to low fire for perfectly grilled fish and using foil pouches to steam shellfish with various infusions. It’s a down to earth, feet in the sand kind of place, so don’t go expecting a Michelin experience, just go for the food. Malta is strongly Catholic and most weekends you will find at least one village celebrating their local saint with a festival, or “Festas”, with ornate, larger than life statues, processions, music and food. These are well worth the effort, particularly if you find those that have a bit more of a food focus, like L-Imnajara, that falls on the 29th of June. Here, you will find a number of different rabbit dishes, as well as other local delicacies, including Maltese snails! There are fireworks almost every night, and you’ll even hear them going off during the day, though I never really got that since you can’t really see them when the sun is out. For cakes and coffee in Valetta, I’d recommend Café Cordinia, which has been a institution for 175 years. Mdina is another great destination where you can have cake at the Fontanella Tea Garden, looking over the ramparts of this ancient walled city, taking in amazing views over the entire island. For the best food in Malta, however, all you need is a grill. My fondest memories are going up to the local fish market, and coming back to my parent’s little courtyard, hiding from the hot sun under the grapevines, grilling a selection of fresh fish, drinking local wine and just enjoying life. I don’t know if it’s being back with my parents, the Mediterranean pace of life, or just the peace that comes from a holiday in familiar surroundings with all the things I love, but I always leave Malta feeling relaxed and as if I’ve somehow spent twice as long as I actually have. And for just a few hours on a plane, it’s is a destination well worth a visit.